How Will Ryan Braun's Appeal Win Impact His Hobby Standing? This afternoon, Ryan Braun saw his 50-game drug-related suspension overturned by arbitrator Shyam Das. The reigning National League MVP reportedly tested positive for elevated testosterone levels back in October. It was a black eye for the game as it still attempts to recover from the steroid scandals. 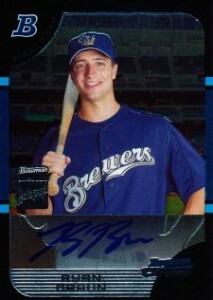 Check out our Ryan Braun Rookie Card Guide. It didn't help Braun's image either. One of the game's most popular players, a drug-related suspension would hang over him for the rest of his career and beyond. Because of that, the appeal win gives Braun's cards and collectibles a major upside once again. In a statement released shortly after the appeal announcement was made, Braun said, "I am very pleased and relieved by today's decision. It is the first step in restoring my good name and reputation. We were able to get through this because I am innocent and the truth is on our side." Although some will likely question Braun's innocence, it's the official record that's important here. He's got a clean slate, something that's important when people talk about legacies. Those legacies factor greatly into a player's long-term status in the hobby. If the suspension was upheld, the public might not have been as forgiving. His good-guy image would disappear and many would look at him with jaded eyes, much like they do Alex Rodriguez. Cynics probably will, anyway, but Braun's overall reputation has been redeemed. With that, Braun's cards and collectibles are much easier to recommend once again. Collectors look fondly upon role models, especially today where so few are able to uphold a squeaky-clean image. Braun's rookie cards can be found in a handful of 2005 products, the most notable of which is a Chrome autograph in 2005 Bowman Draft Picks & Prospects. Over the years, Braun has signed for a ton of products, keeping his autograph prices in check, especially when you factor in his accomplishments. Since the suspension was initially announced, Braun's cards haven't taken too much of a hit. While his 2005 Bowman Chrome autograph is selling for slightly less than it was at the end of November, that could also be because of the off-season. The big thing to watch for, hobby wise, is the long-term impact. Going forward, expect Braun to be watched very closely in 2012 and the rescinded suspension is only part of the story. As the reigning MVP, attention was a guarantee. He helped lead the Brewers to the postseason in 2011, which further raised his stock. The biggest mystery is how well Braun will do without Prince Fielder in the lineup. Should the Brewers continue to do well with Braun as the undisputed leader of the team, look for his cards to soar. At this point, collectors have come to expect the numbers from the outfielder. To get to the next level, he needs the wins. Without the suspension looming over his name and legacy, the focus will once again be on Braun's play--exactly where it should be. I’m looking forward to the explanation of why his suspension was overturned. Until then, I’m a cynic. He’s speaking today, but I doubt he will shed light on why the suspension was overturned. What was his explanation of the high testosterone levels? Also interested in seeing how he will do this year, if his production dips significantly, will it be due to Fielder not protecting him or lack of something else? Juicer! He’ll forever be a phony in my eyes.